You know I adore anything green and herbs are no exception. They pack such wonderful flavor, plus have the added benefit of being extremely detoxifying and nutritious. Herbs instantly elevate any dish, and in this case, help turn a plate of pasta into a healthful meal, as opposed to a reason for guilt. In this simple version, I skipped the tomatoes and piled on the herbs and spinach. I highly suggest using brown rice pasta. Regular pasta, even whole wheat pasta, is so highly refined, that manufacturers add synthetic vitamins back into it. (When you look at the ingredient list, you’ll see what I mean). It’s glycemic load is on par with Coco Pops, which means it causes a significant blood sugar spike. Blood sugar spikes zap your energy and can contribute to weight gain and other health issues, so you want to avoid them. Brown rice pasta, on the other hand, has a lower glycemic load and is made from two simple ingredients, brown rice and water. 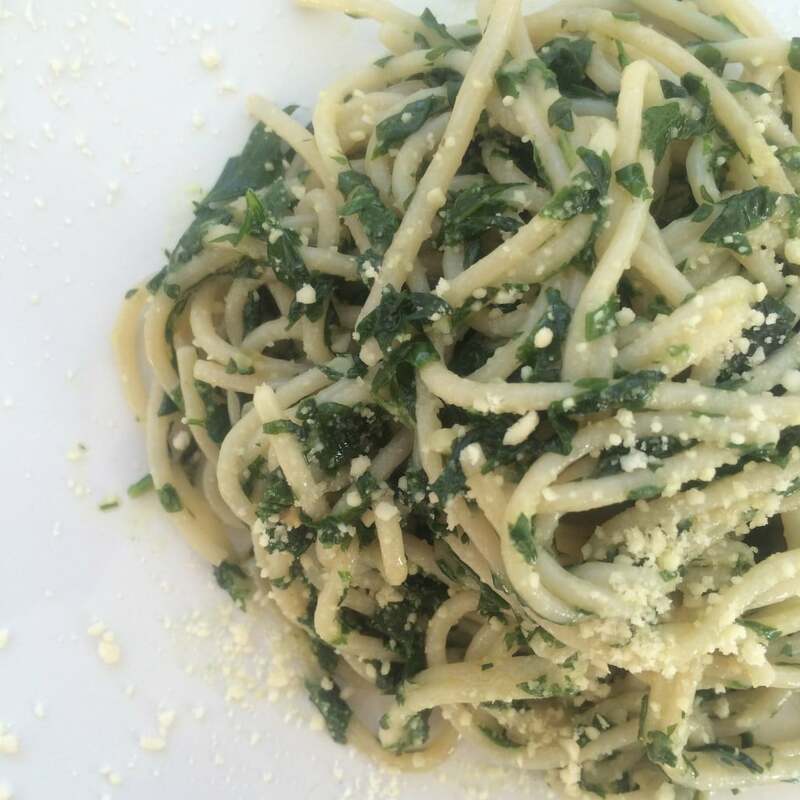 It allows you to avoid the bloated and heavy feeling that typically comes after eating pasta, it offers some nutrients, and is naturally gluten-free. Plus, it tastes exactly like regular pasta. (Tinkyada brand does anyway…I’ve tried a few and this is by far the best). I also like mung bean pasta and black bean pasta, but brown rice pasta tastes the most like the real thing, and is also the most economical. Pasta allows you to”sneak” tons of veggies in with ease. For this particular dish, I’ve added in 4 cups of greens, which allows for 2 cups per person! If you add in a pint of cherry or grape tomatoes, that is easily another cup of veggies per person. It helps neutralize particular types of carcinogens which is crucial for us urban dwellers, who are constantly exposed to pollution. It’s also off the charts for Vitamin K (needed for bone health) and an excellent source of Vitamins C and A, both powerful antioxidants needed for not just strong immunity, but gorgeous and youthful looking skin. I’ve added spinach in addition to the parsley, so that my pasta is adequately covered in the good green stuff. What is pasta without cheese? Much better. Dairy is hard to digest for most people, and doesn’t add much but empty calories and additional hormones, which we don’t need. You can achieve the same texture and taste of cheese simply by sprinkling on salt and almond flour. How convincing does it look in the picture?! Trust, me it tastes just as good as it looks, and gives an additional nutrient and protein boost. Try this dish and you will never go back to regular pasta again. If you try it, please share your comments below! A delicious parsley covered pasta with garlic and onion. 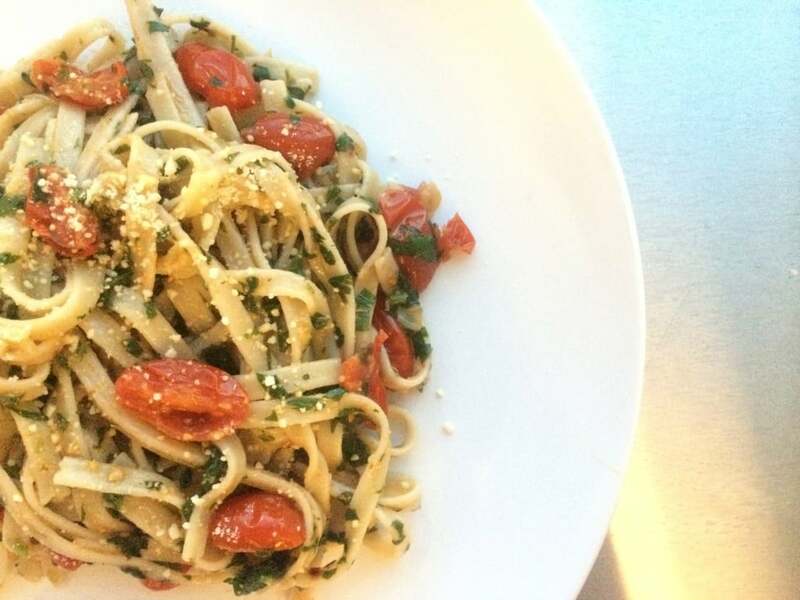 This fresh herb pasta instantly heathifies what is typically considered an unhealthy dish. Boil water and add the pasta, cooking for approximately 15 minutes, or according to package directions. Meanwhile, heat a pan over medium / medium low, and add the olive oil to coat. Cook the onions for 2-3 minutes, until soft, not brown, then add the tomatoes in if using. Cook an additional 2-3 minutes until they blister, then add in the garlic, parsley, and spinach. You can remove from the heat once the greens are wilted down and saturated, about another 2-3 minutes. Drain pasta, transfer to a serving bowl, and top with the parsley mix. Season with salt and sprinkle with almond flour. You can use any herbs you like in place of the parsley. Basil is a favorite. Absolutely love this dish! So easy to make, and even though I am a pasta-hound, the pasta she recommends for this is even better – satisfying but no quick carb high and drop. The “cheese” is such a surprise too – it has a slightly nutty flavor as you might expect, but enhances the other flavors in the dish and doesn’t weigh you down like dairy cheese can. Best of all, the dish is not only health but fast to make. I am a covert! Thanks Maria!